“Jesus’ way of seeing things leaves no room for the mentality which would cut bait on the weak and those most in need. Taking the lead, he gives us his own example, he shows us the way forward. What he does can be summed up in three words. 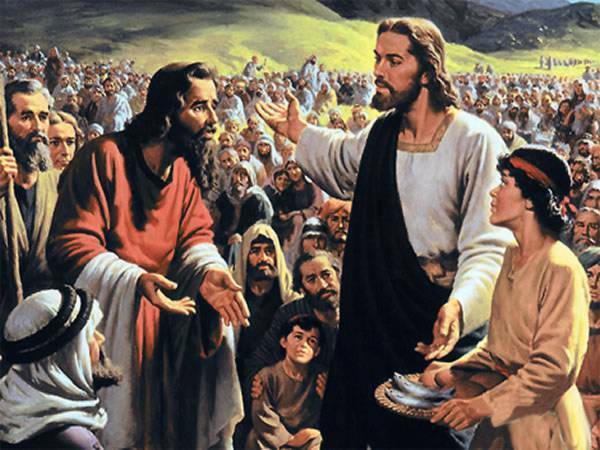 He takes a little bread and some fish, he blesses them and then gives them to his disciples to share with the crowd. And this is how the miracle takes place. It is not magic or sorcery. With these three gestures, Jesus is able to turn a mentality which discards others into a mindset of communion, a mindset of community…. Taking. This is the starting-point: Jesus takes his own and their lives very seriously. He looks at them in the eye, and he knows what they are experiencing, what they are feeling. He sees in those eyes all that is present in the memory and the hearts of his people. He looks at it, he ponders it. He thinks of all the good which they can do, all the good upon which they can build…. Jesus never detracts from the dignity of anyone, no matter how little they possess or seem capable of contributing. He takes everything as it comes. Blessing. Jesus takes what is given him and blesses his heavenly Father. He knows that everything is God’s gift. So he does not treat things as “objects”, but as part of a life which is the fruit of God’s merciful love. He values them…. He asks the Father for the gift of the Holy Spirit. Blessing has this double aspect: thanksgiving and transformative power. It is a recognition that life is always a gift which, when placed in the hands of God, starts to multiply. Giving. With Jesus, there can be no “taking” which is not a “blessing”, and no blessing which is not also a “giving”. Blessing is always mission, its purpose is to share what we ourselves have received. For it is only in giving, in sharing, that we find the source of our joy and come to experience salvation. Giving makes it possible to refresh the memory of God’s holy people, who are invited to be and to bring the joy of salvation to others…. Jesus generated a kind of electrical current among his followers, as they shared what they had, made it a gift for others, and so ate their fill…. 2402 In the beginning God entrusted the earth and its resources to the common stewardship of mankind to take care of them, master them by labour, and enjoy their fruits. The goods of creation are destined for the whole human race. However, the earth is divided up among men to assure the security of their lives, endangered by poverty and threatened by violence. The appropriation of property is legitimate for guaranteeing the freedom and dignity of persons and for helping each of them to meet his basic needs and the needs of those in his charge. It should allow for a natural solidarity to develop between men. … 2404 “In his use of things man should regard the external goods he legitimately owns not merely as exclusive to himself but common to others also, in the sense that they can benefit others as well as himself”(Vatican II document: Gaudium Spes, section 69). The ownership of any property makes its holder a steward of Providence, with the task of making it fruitful and communicating its benefits to others, first of all his family. 2405 Goods of production — material or immaterial — such as land, factories, practical or artistic skills, oblige their possessors to employ them in ways that will benefit the greatest number. Those who hold goods for use and consumption should use them with moderation, reserving the better part for guests, for the sick and the poor.